Available for the First Time: Neville Goddard's Most Stirring and Practical Psychological Lectures. In 1952, spiritual visionary Neville Goddard delivered a series of deeply insightful talks on how to break through your psychological dilemmas using the limitless creative powers within you. Speaking in San Francisco, the teacher laid out his mental and mystical program with complete clarity and depth. These lectures have been lost to time - until now. Margaret Ruth Broome - a trusted and longtime student of Neville's - edited and transcribed these talks from a series of personal notes. These concise lessons illuminate Neville's teaching for the newcomer, and provide fresh ideas and practices for the longtime student. Narrated by historian Mitch Horowitz, The Power of Unlimited Imagination is an unforgettable journey into the work of a modern master. "The positive-thinking movement's most radical and subtly influential voice." -Mitch `Horowitz, Time.com Born to an English family in Barbados, Neville Goddard (1905-1972) moved to New York City at age seventeen to study theater. In 1932, he abandoned his work as a dancer and actor to dedicate himself to a career as a metaphysical writer and lecturer. 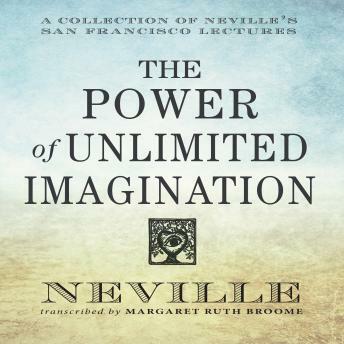 Neville influenced a wide range of spiritual thinkers, from Joseph Murphy to Carlos Castaneda.